The function of your BMW timing gears is to allow the camshaft and crankshaft to turn the timing chain. 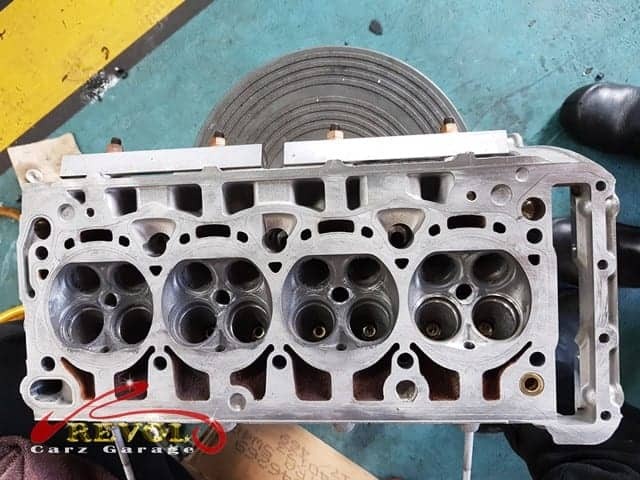 The pistons are moved up and down by the turning of the crankshaft which also allows the intake and exhaust valves on the cylinders to open and close. These components are important for optimum engine timing. As the piston moves downward, the intake valves open to allow fuel and air into the cylinders. As the piston moves upward, the exhaust valves open to expel exhaust air from the cylinders. If the intake valves are not functioning properly, the correct air/fuel mixture will be able to enter into the cylinders. If the exhaust valves are not opening and close properly, exhaust air will be trapped inside the cylinder. If the timing gears are failing, the valve timing and ignition timing will not be accurate. Noises from the engine compartment may occur, causing the engine to run rough, backfire or stalled. We hope you will enjoy viewing the following pictures. 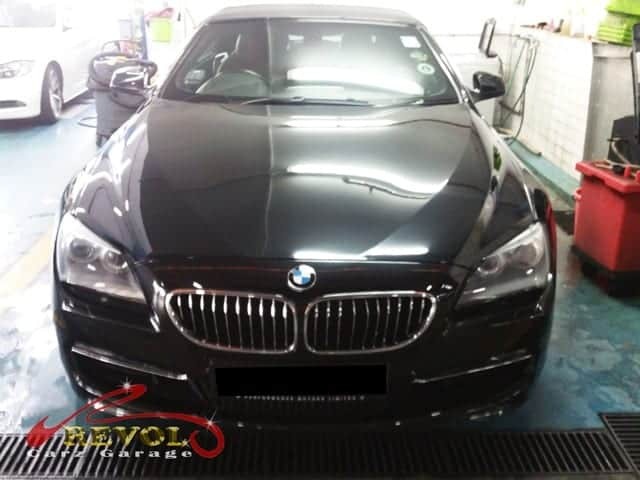 The BMW 640i was towed to Revol Carz Garage for diagnosis. The car was lifted for accurate diagnosis and thorough safety and functional inspection. The original BMW parts spread next to the worn-out ones, ready for replacement. The new timing gear set was professionally replaced by our BMW specialists. 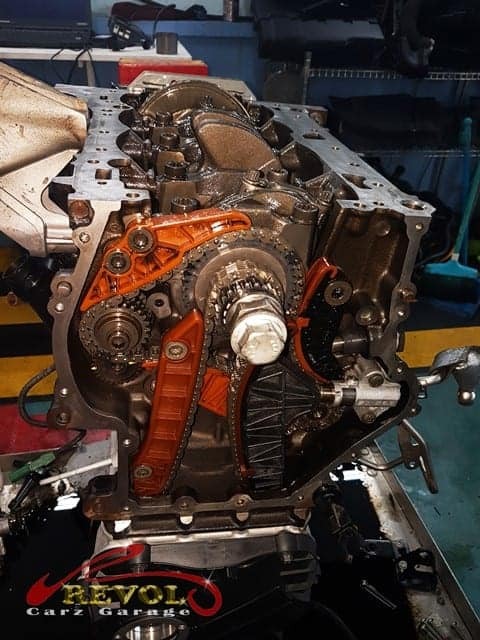 The timing gear replacement job was completed after our QC team successfully conducted a running test. Wishing you and your family a Selamat Hari Raya Haji! 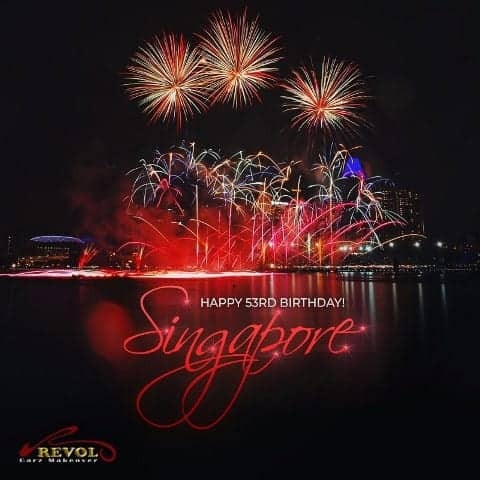 Happy 53rd National Day Singapore! 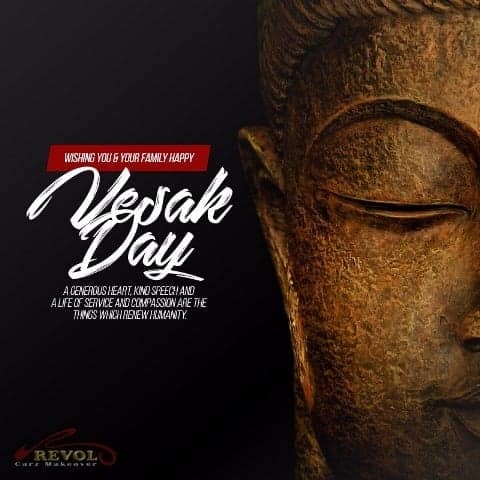 The National Day of Singapore is celebrated every year on 9th August, in commemoration of Singapore’s independence from Malaysia in 1965. Cheers to the 53rd Years of Independence! Wishing All a Happy National Day! Want to feel like 007? 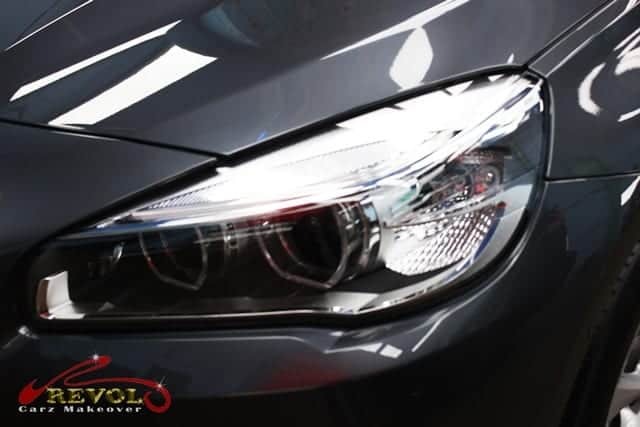 Have your car armored with ZeTough Ceramic Protection Coating by Revol Carz Makeover for that knockout luster. ZeTough may not make your car bullet-proof but certainly warrants a life-time of paint protection license to thrill. Aston Martin and James Bond is a combination which has left an indelible mark on popular culture. 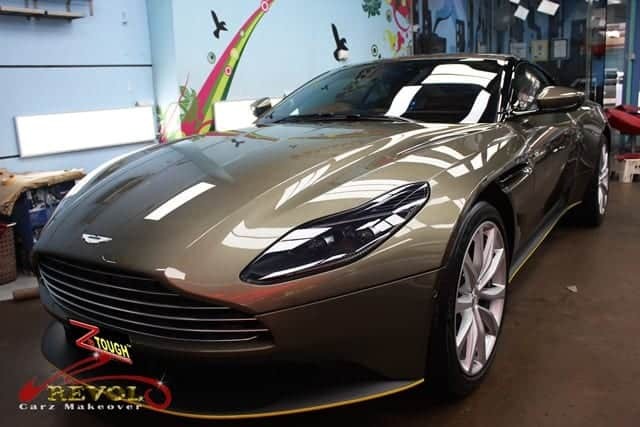 The exotic 2018 Aston Martin DB11 is a statement of taste and style. It’s curvaceous, but slender, though longer, lower, and wider than the DB9 it replaces. It’s absolutely beautiful inside and out, and there is no better way to arrive in style for that incredible makeover at Revol. The glorious twin-turbo 4-litre ‘Hot-Vee’ V8 engine wakes up with more immediate response to throttle inputs and thrilling soundtrack. The V8 drives the rear wheels through an eight-speed paddle-shift automatic gearbox with the century-sprint in just 3.9 seconds and hitting a top speed of 300.95km/h. Lightness and strength, the DB11 is underpinned by a new bonded aluminum body that sets a formidable new standard for the legendary DB lineage to unprecedented heights. 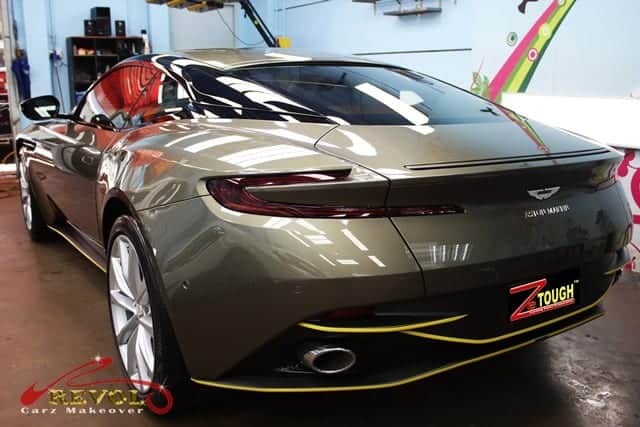 Put on the seatbelts; we’re on a mission to thrill our readers with new posting below… the progressive and incredible make-over of the Aston Martin DB11at Revol Carz Makeover. Licensed to thrill! 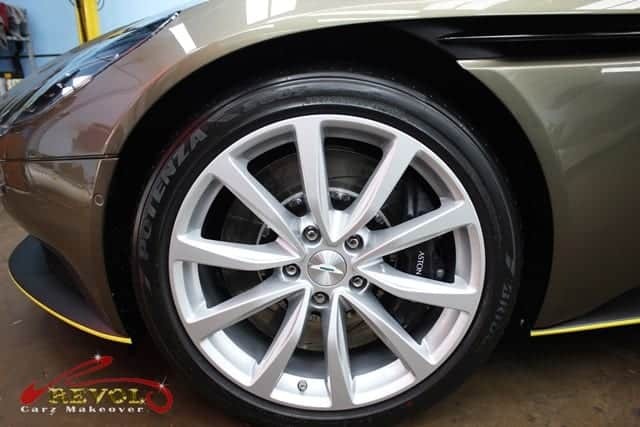 The Aston Martin is armored with ZeTough Ceramic Paint Protection Coating for a long-term shine. The large clamshell hood is just one piece of rolled aluminum, creating a clean look for the entire front. 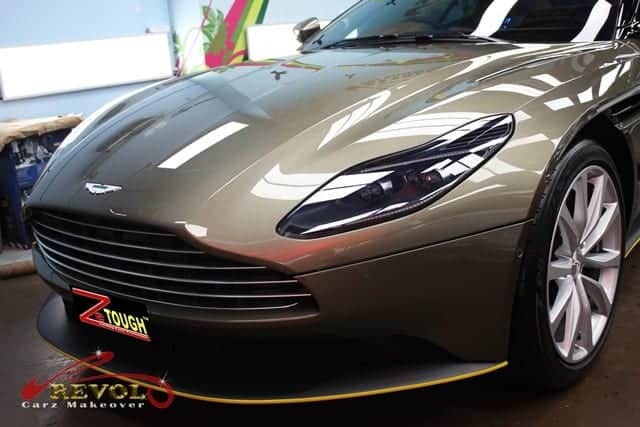 ZeTough amplified the deep luster on the front end with the iconic Aston Martin grille and clamshell hood. The iconic headlights get much pampering with tender polishing by hand. Pop open the clamshell bonnet reveals a pride of a super-clean 4-litre ‘hot-vee’ engine that has been painstakingly detailed by our groomers. 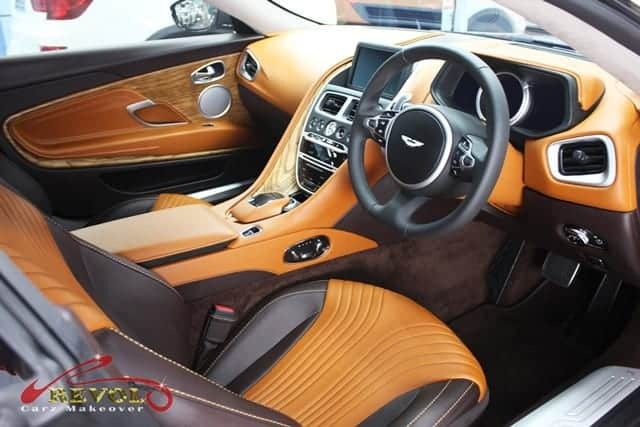 Detailing the every inch of interior in the Aston Martin was an exhilarating challenge. Aston’s DB11 is swathed in expensive materials and on-board infotainment system with an eight-inch central screen and 360 degree cameras as standard. It’s an easy winner with Revol’s detailing. There’s a handmade quality to most things you touch, like the brogued leather on the doors and the stitching around the Sat Nav screen. Welcome to the DB11’s cabin. The absolutely clean and beautiful environment are lathered in leather and accented with electronics. Scrutinize closer at the automatic wing-mirror and awe at the wonders of ZeTough Ceramic Paint Protection Coating. The body widens at the rear haunches, then tucks in quickly and wraps around the rear end. ZeTough indeed adds that extra showroom shine. The rear active spoiler on the DB11 V8 comes standard. At Revol Carz Makeover, we leave no stone unturned. We cleaned the exhaust pipe to perfection. We actually removed the entire 20-inch 10-spoke unique graphite finished diamond wheels for 100% cleaning for a very accomplished restoration. 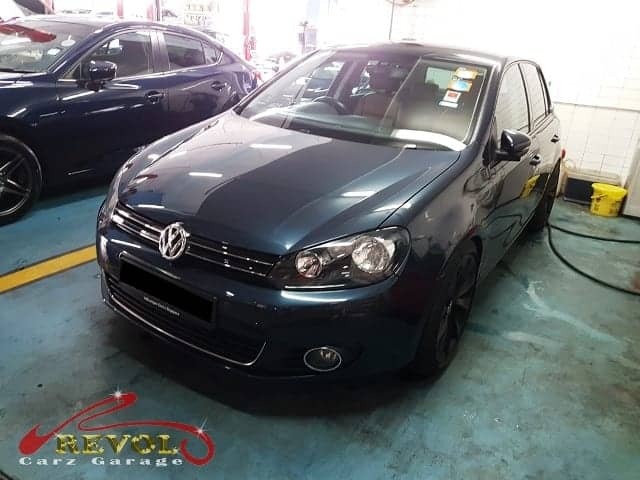 Nothing gives us more inspiration than giving every car-owner more reasons to smile with happy astonishment when they come to collect their cars after the incredible makeover. Thanks to the magic of ZeTough Ceramic Paint Protection Coating. After Revol’s professional makeover, the Aston Martin indeed looked much better than in showroom condition – and ready to thrill. ZeTough’s incredibly long lasting protective luster promises to give the paintwork a lifetime protection. Are you also thrilled by the stunning outcome of the makeover on the Aston Martin? Your car too can enjoy the reliable, long lasting surface protection. You can count on our award-winning and proven, ZeTough Ceramic Paint Protection Coating. Yes, imagine what we can do for your car! A brand new 2018 Urban Mercedes GLA180 headed straight and hot from the showroom to Revol Carz Makeover for a comprehensive surface treatment with ZeTough Ceramic Paint Protection Coating and professional interior detailing. The redesigned GLA180 stands out with a sporting character of a Mercedes SUV with a huge central “Mercedes Star” and the wide new grille with twin matte silver cross-wings, each punctuated by six chrome-outlined slots sweep outward to its curving sides. Under the hood lies a 4-cylinder Turbo Displacement 1,595cc Propellant petrol power engine with 200Nm torque. Acceleration from 0-100km/h is claimed at 8.7 seconds and a top speed of 200km/h. We are delighted to show our readers how we had transformed the brand new GLA180 to sparkle “better-than-showroom” condition after the ZeTough Ceramic Paint Protection Coating treatment. 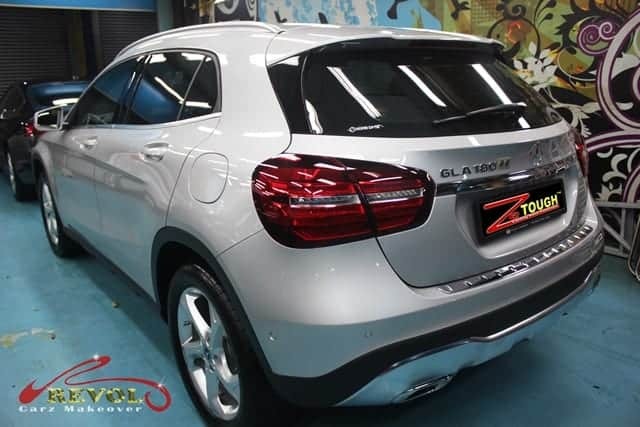 The 2018 GLA180 sparkles, “better-than-showroom” condition after the ZeTough Ceramic Paint Protection Coating treatment. The wide new iconic grille with its large central star and matte silver cross-wings, each punctuated by six chromed outline slots can’t be mistaken for anything else but a true Mercedes Benz. Front view of the GLA180 after the ZeTough Paint Protection Coating treatment. Under the hood lies a super-clean 4-cylinder Turbo 1,595 cc petrol power engine. Every inch of the engine compartment is passionately detailed. 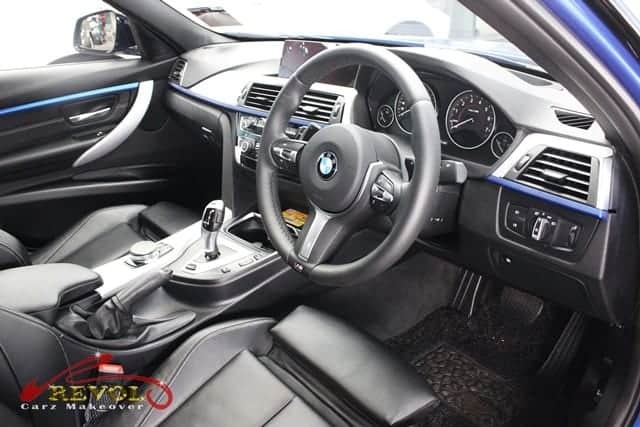 Our professional detailers had committed many hours in ensuring the interior is absolutely cleaned, polished and all the leathers are protected and nourished. Dynamic select dials for your many driving moods with a tap of a console button. A super-clean interior sets up a calm mood for the occupants. Two-tube instrument cluster with silver-colored back-plates in checked flag design and red needles. Side mirrors with Blind Spot Assist. The radar technology helps sense when a vehicle enters the blind-spot area. An icon illuminates in the side mirror to alert the driver and also gives an audible warning. The 9H hardness of the ZeTough Ceramic Paint Protection Coating prevents common finger-nails scratches on the car-door handles. Rear view of beautiful GLA180 after the ZeTough Ceramic Paint Protection coating is fully cured. The Power Tailgate with hands-free access lets you open with a gentle flick of your foot under the rear bumper. 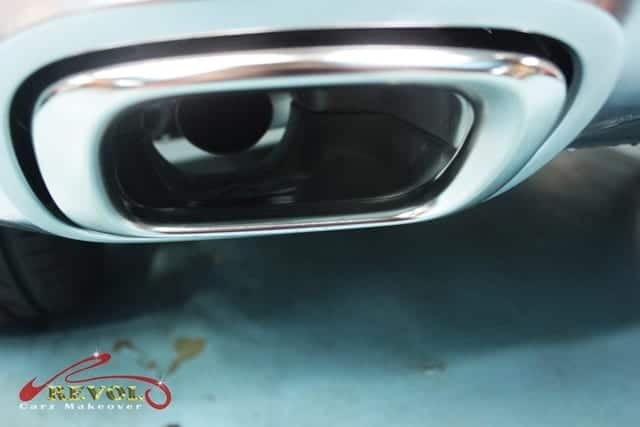 Polished with utmost care, the twin-pipe exhausts with chrome-plated tailpipe trim. 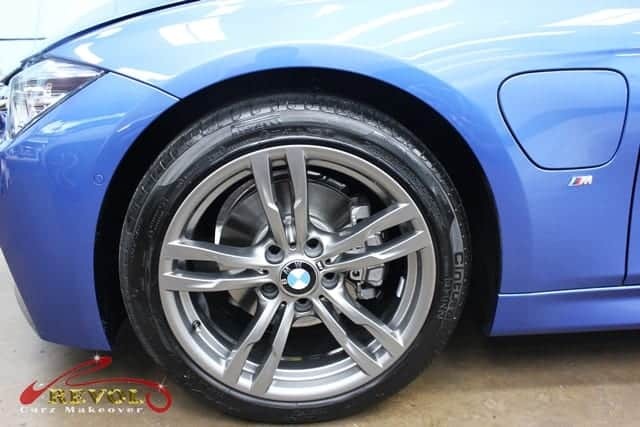 The cleaned and polished 17” 5-spoke light alloy wheels add to the sporty look. We trust the dazzling makeover of the new Mercedes GLA180 to even “better-than-showroom-condition” has won your heart. Perhaps you would like to consider ZeTough Ceramic Paint Protection Coating to incredibly transform your car too. Giving your car a new coat of paint is more than just about vanity. It helps to protect your vehicle’s surface, makes it looks good and lasts longer. You can also give your car an additional clear coat of glass-like, long-lasting seal of ZeTough Ceramic Paint Protection Coating. Ceramic coating helps keep your car looking hyper shining and protects the paintwork from environmental stresses too. 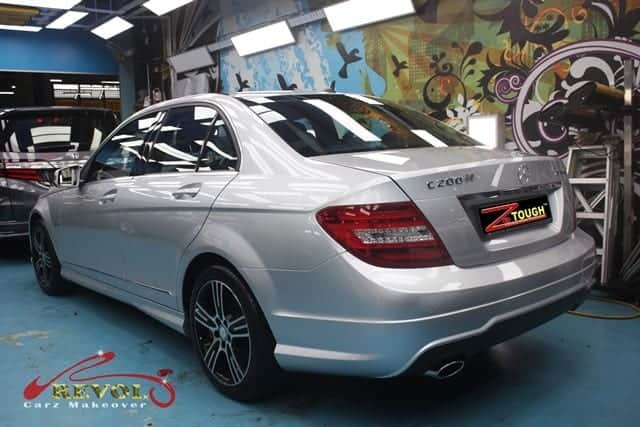 Be vowed by the incredible makeover of the limited Edition C Mercedes Benz C200 performed at Revol Carz Makeover. With a new coat of premium quality paint and the most advanced ZeTough Ceramic Paint Protection Coating, we have turned the C200 into a stunning better-than-showroom beauty that lasts for years despite our harsh tropical environment. The Limited Edition C features an electric sunroof, Apple Car-Play (and Android Auto) and 19-inch alloy wheels. Power comes from a 2.0-litre turbocharged four-cylinder engine mated with a nine-speed automatic transmission and generating 135kW of power and 300Nm of torque. 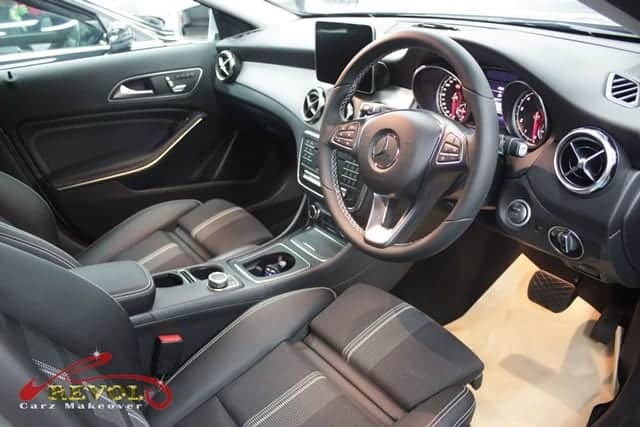 Upgrades include Artico faux-leather upholstery, a 7-inch Infotainment system with satellite navigation, electric adjustable seats, keyless start, dual zone climate control, piano-black console trim and brushed aluminum interior accents. Let us intrigue you with the ‘before’ and ‘after’ transformation of the Mercedes Edition-C as we cruise you through the following picture posts. The lens of the headlights were getting blurry before the makeover. Subtle scuffs and minor scratches were also found all around the car. Alas at Revol Carz Makeover, we transformed the C200 into a stunning better-than-the-showroom gem with a new coat of premium paint and finishing with the most advanced ZeTough Ceramic Paint Protection Coating. The sculpted gleaming bonnet with the large iconic Mercedes Star on the grille projects its assertive looks after the Revol makeover. The LED headlamps were painstakingly polished by hand to achieve a perfect crystal-clear look. The task of achieving a super-duper clean engine bay is a huge reward and pride for our detailers. The 2.0-litre turbocharged four-cylinder engine is mated with a nine-speed automatic transmission, making 135kW of power and 300Nm of torque. The Nine-Speed automatic transmission is cleaned and polished. Our detailing guru gets down to nitty-gritty details to spruce up and accomplished a super-clean interior. The piano-black console trims and brushed aluminum interior accents are sparkling clean and well-polished. 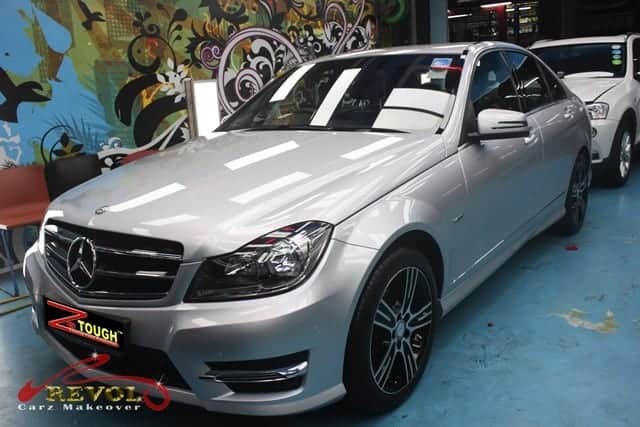 A glance at the breathtaking lustre and you know the Mercedes Edition-C200 is treated with the advanced ZeTough Ceramic Paint Protection Coating. The exhaust tail-pipe covered with soot before makeover. 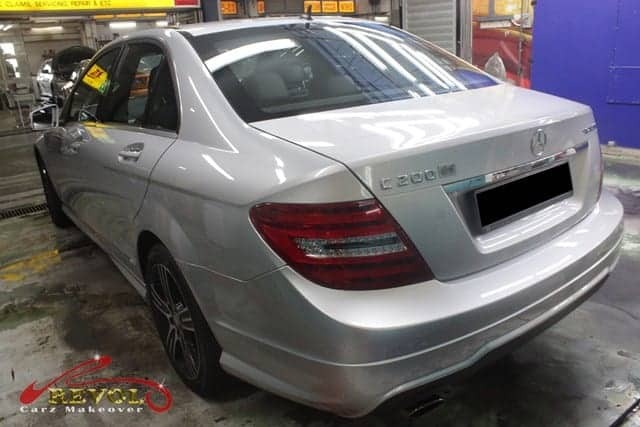 The exhaust tail-pipe enhances the overall new-look of the C200 after cleaning and polishing. The ‘before’ condition of the wheels was in deplorable state. All the alloy wheels have been tirelessly cleaned, polished and restored to showroom condition, complimenting the glamorous finishing of Revol’s professional makeover. 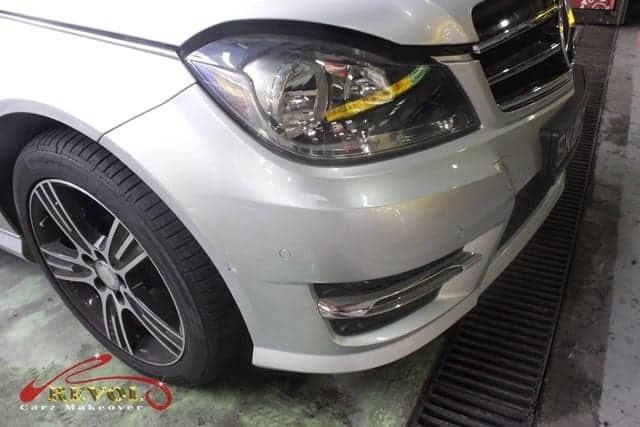 Nothing gives us more inspiration than seeing the owner beaming a mega-watt smile when he was stunned by his gleaming, transformed Mercedes C200 after the makeover. Thanks to the magic of ZeTough Ceramic Paint Protection Coating for the extraordinary achievement. 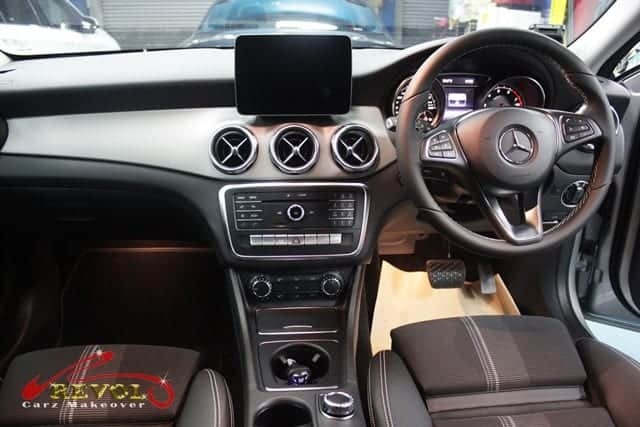 After Revol’s professional makeover, you can see that the Mercedes Edition C200 looks astonishingly better than its previous showroom condition – permanently. ZeTough’s incredibly long lasting protective lustre gives the car a lifetime of protection. Impressed by the stunning outcome of the makeover? Your car too can enjoy the reliable, long lasting surface protection. You can count on our award-winning and proven, ZeTough Ceramic Paint Protection Coating. Yes, imagine what we can do for your car! 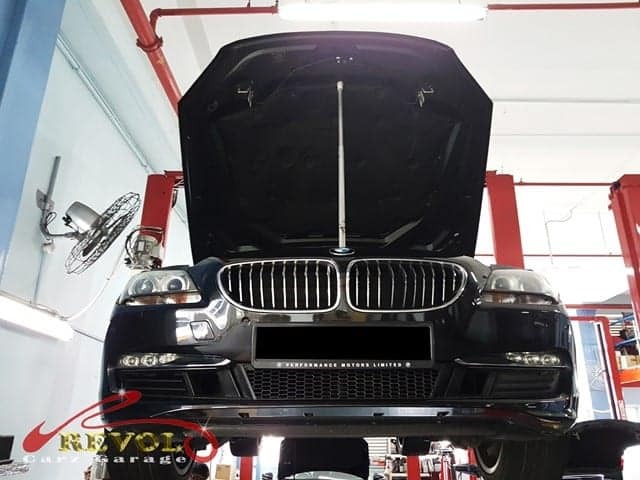 A latest model 3-Series Plug-in Hybrid iPerformance Powertranin, BMW 330e was here at Revol Carz Makeover for the ZeTough Ceramic Paint Protection Coating treatment for long-term tough-shield on its factory-original surface. The “e” denotes a plug-in-hybrid powertrain in the new iPerformance line-up. At the heart of the BMW 330e is a 2.0-liter turbocharged four-cylinder engine mating an 8-speed Steptronic Sport automatic transmission. An electric motor generates 87 horsepower and 74 lb/ft of torque. A large 7.6 kWh Lithium-ion battery constrains the trunk considerably and forces the gas tank to shrink to just 40.88 litres (10.8 US gallons). In Max eDrive full electric driving mode, 120.7km/h (75mph) is achievable. But since there are only 87 horsepower on tap, the accelerator also fires up the gas engine. BMW claims the 0-100km/h sprint in 6 seconds. The 330e has the same clean look, chrome highlights and high glossy black surfaces throughout the cabin. The center console is a new eDrive button that allows the driver to select between three specific drive programs – (1) Auto eDrive, (2) Max eDrive and (3) Save Battery. What’s more? 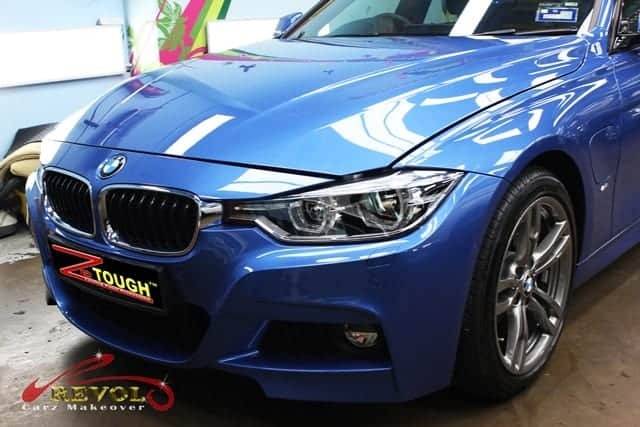 The award-winning, ZeTough Ceramic Paint Protection Coating has certainly added greater value to the BMW 330e’s gleaming surface with long-lasting, tough glass-like shield. 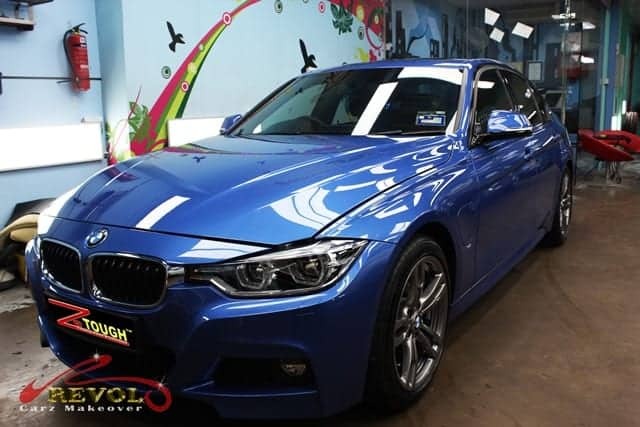 We are pleased to present the 3-Series Plug-in Hybrid BMW 330e after surface treatment with the award-winning ZeTough Ceramic Paint Protection Coating. There isn’t much difference that separates the 330e from the standard 3-series sedan. It has the same aggressive front fascia and iconic kidney grills. However the obvious difference on this 330e now is the astonishing ZeTough Coating finish. 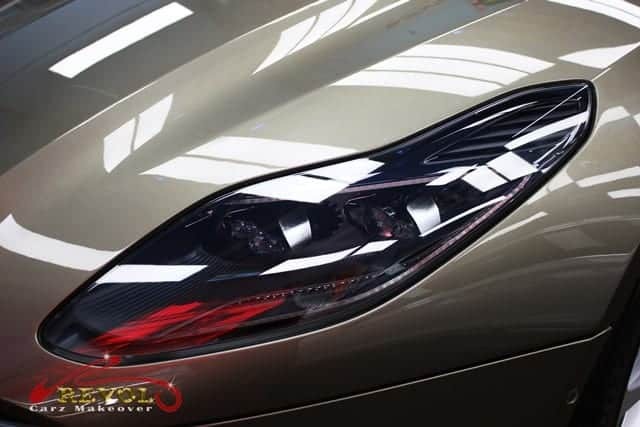 The LED headlamps were carefully polished by hand to achieve the super-clear looks. 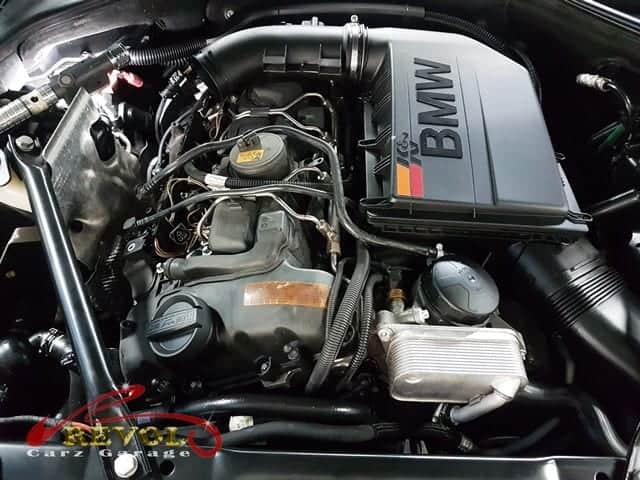 At the heart of the BMW 330e is a super-clean 2.0-liter turbocharged four-cylinder engine passionately detailed by the professional crew at Revol Carz Makeover. The 330e has the super clean look with chrome highlights and high glossy black surfaces throughout the cabin with our professional detailing. The leathers are enriched and nourished for long term protection. The electric charger must be free of dust and clean. The rear view of the BMW330e is just as eye-catching after the treatment of ZeTough Ceramic Paint Protection Coating. The L-shaped tail-lamps are hand-polished to shine like gems. 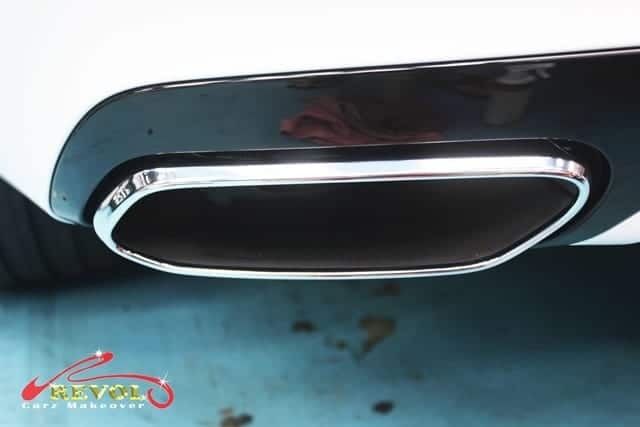 The twin chrome tail-pipes are perfectly cleaned and polished. The finale of the Revol Carz Makeover is giving all the wheels the ultimate showroom finishes. We hope you are fascinated b the performance of the award-winning, ZeTough Ceramic Paint Protection Coating on the new BMW M240i? Yes, imagine what we can do for your car too. 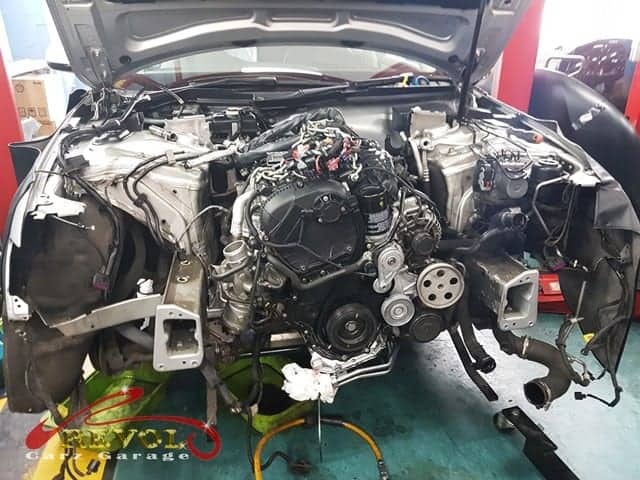 Another Audi A4 has been successfully done the engine overhaul! Do you feel your car has not been running efficiently and it seems thirsty for oil top up and high fuel consumption? Your car has probably already clocked high mileage by now. It could be time for an engine overhaul or reconditioning. Engine overhaul or recondition can benefit you in the long run if the work is done properly by specialists. 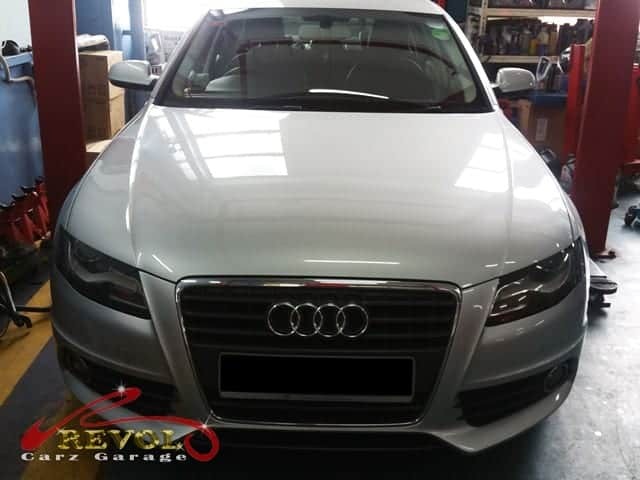 At Revol Carz Garage, our trained mechanics did an excellent engine overhaul on the Audi A4 recently. With a new lease of life after the overhaul, the Audi now performs like a brand new car; much to the delight of the proud owner. 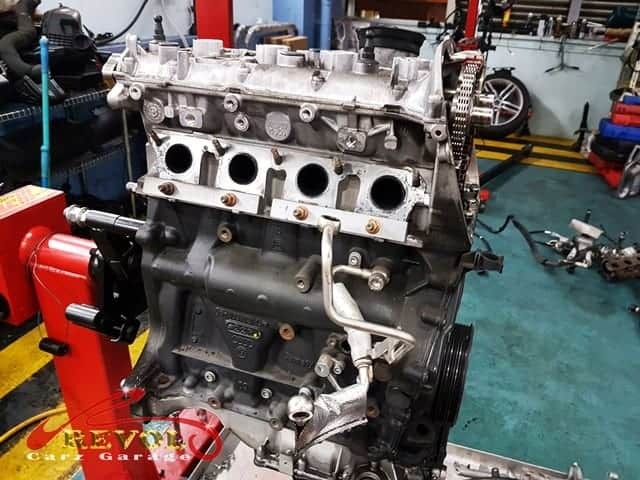 Whether you are looking for a complete overhaul of your vehicle engine, or repair, our fully-equipped workshop provides extensive in-house engine reconditioning, overhauling or repair services. We use advanced equipment and technology to optimize our works professionally. 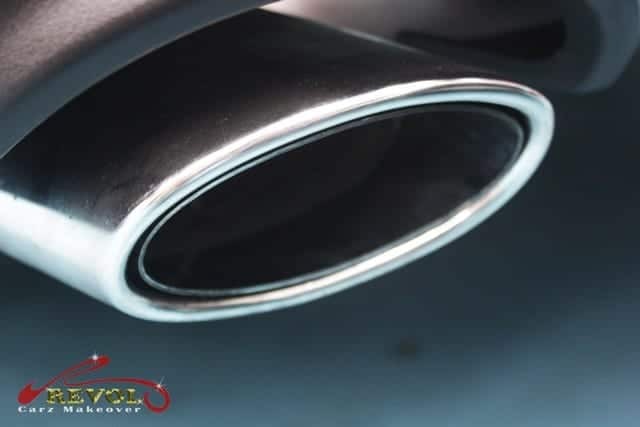 Our commitment is to provide you with quality, value-for-money and unparalleled service to restore your engine to tip-top shape and have your car running most smoothly and efficiently. You are guaranteed of excellent customer service from us because when it comes to getting the job done right, we go the extra mile to meet your high expectations. You get the best advice and value for money, backed by six months warranty. An overhauled engine is only as good as the parts that are used and the mechanics doing the rebuilding. We will get your engine back into tip-top shape, with the performance, reliability and economy of a new car. For every engine overhauling job that take on we source and order only premium-quality parts from reputable suppliers. This means the heart of your car gets reliable premium parts for life span. 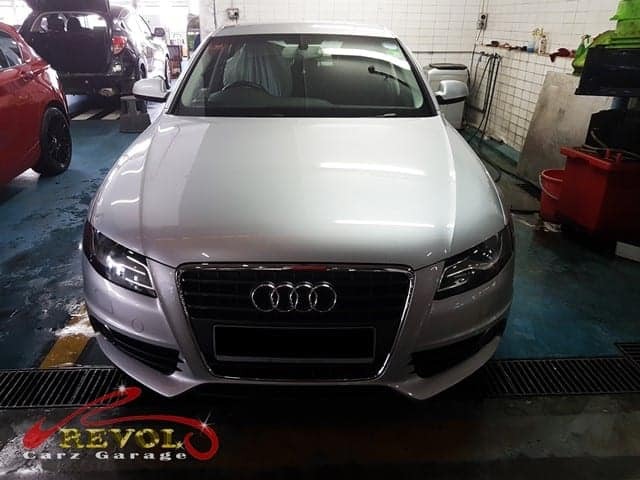 We welcome another Audi A4 to Revol Carz Garage for an engine overhaul. The A4 is lifted up in preparation for pre-overhaul inspection. We dismantled the front panel, bumper and other parts of the car, such as the headlights, reinforcement bar in the overhaul protocol. The engine unit is carefully lifted out for overhauling. The engine is carefully open up to expose the inside of the A4 engine before overhaul. Overhauling is in progress on the cylinder head. The piston on the left is badly worn engine piston in comparison with brand new one on the right. 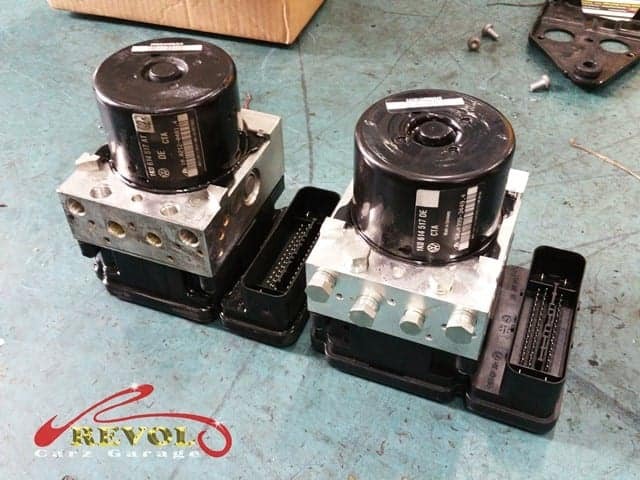 We supply only genuine, original replacement parts. The engine parts are skillfully re-assembled with precision after the overhaul and cleaning. We proudly present the Audi A4 with a professionally rebuilt engine. 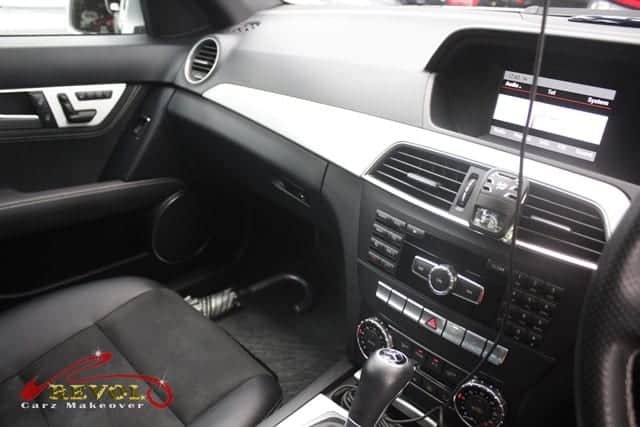 After all the repair works are completed, we also provide a complimentary car wash and vacuuming of the interior. 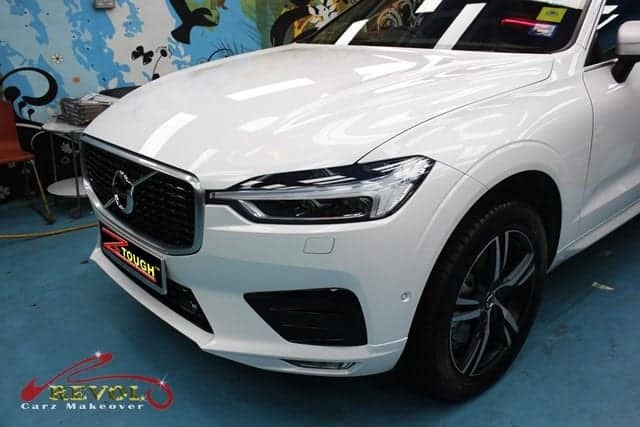 Just arrived from Sweden, the all-new Volvo XC60’s first priority was rolling into Revol Carz Makeover for an immediate ZeTough Ceramic Paint Protection Coating. The Swedes has launched a much more stylish 2018 XC60 model into the compact luxury SUV/Crossover segment with splashy impact. The XC60 looks bigger than its predecessor, more handsome with a long hood and clipped front and rear overhangs. 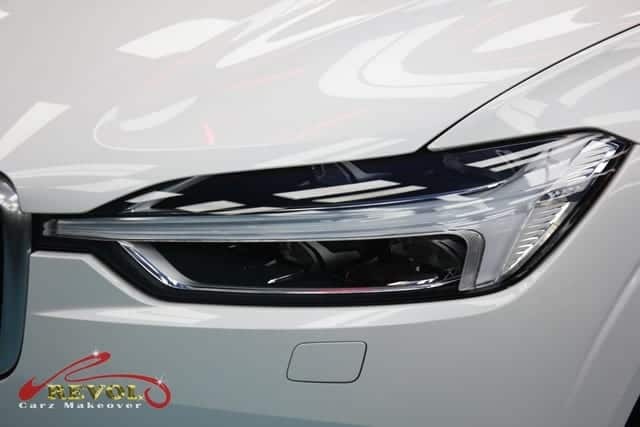 The new Volvo design incorporates the Thor’s Hammer T-shaped LED headlights, gentle undulating fender bulges and intricate tail-lights. The interior is just as stylish as its big brother, XC90 with the same vertically oriented touch-screen. The dashboard detailings are upscale and lend the cabin an air of luxury. Powering the T6 version is a 2.0-litre twin-charged engine that produces a highly impressive 320bhp and 400Nm of torque. This allows the XC60 to propel from 0-100km/h in just 5.9 seconds. 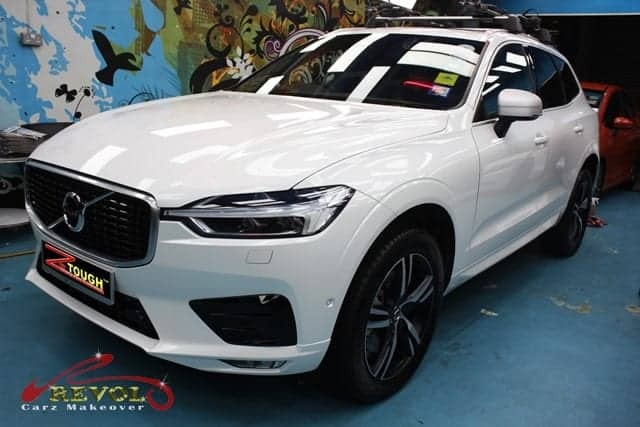 We are all excited about posting pictures of the 2018 Volvo XC60 after the ZeTough Ceramic Paint Protection Coating treatment. The newly arrived Swedish XC60 T6 R-Design Volvo looking fantastic after the treatment of ZeTough Ceramic Paint Protection Coating. ‘Thor’s Hammer’ LED head lights look brilliant after polishing by hand. 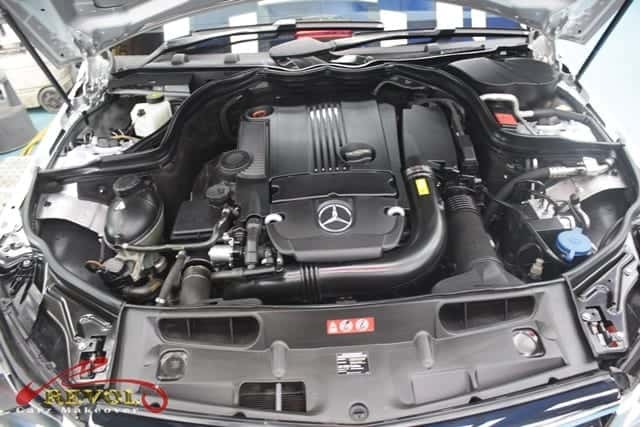 Our skilful detailing results a super cleaned and polished engine is our reward. 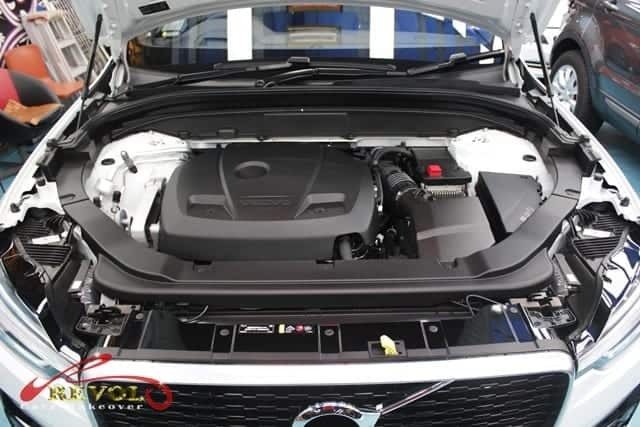 The XC60 receives a 2.0-litre twin-charged engine that produces an impressive 320bhp and 400Nm of torque. 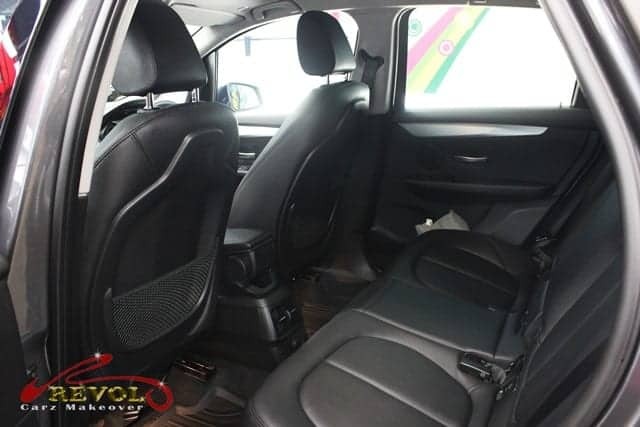 Even for a brand new car like this XC60, we carefully detailed the interior and nourished the leathers for a long-term protection. The Volvo XC60 is packed to the brim with safety features such as, Adaptive Cruise Control, Lane Departure warning, City Safety with full auto brake and Pedestrian and Cyclist Detection, Oncoming Lane Mitigation to name a few. The clean and polished giant tablet-style infotainment system taking centre stage on the dashboard, surrounded by high-quality materials that give the cabin a premium feel. 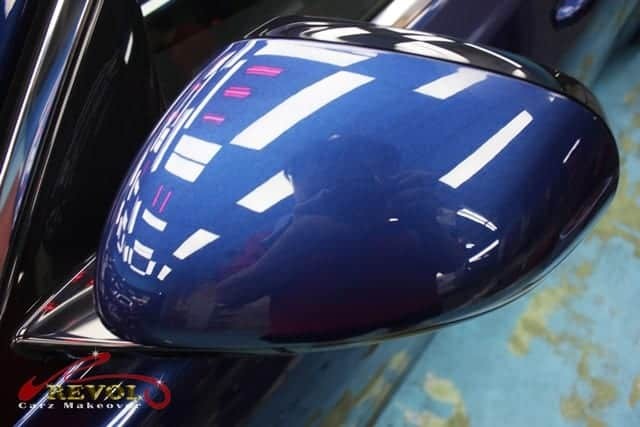 Close up view of the silver-capped side mirror. 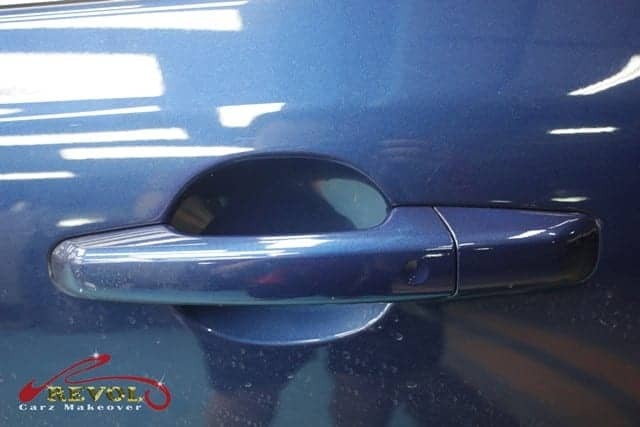 It is unthinkable to have common finger-nail scratches on the door handles of a brand new car. 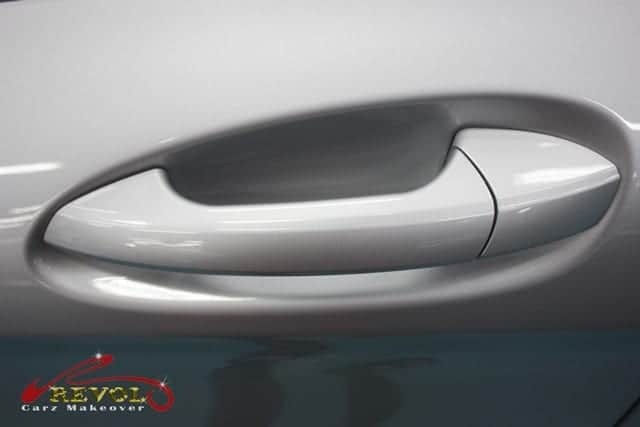 ZeTough Ceramic Paint Protection hard coating ensures the door handles are scratch-free. 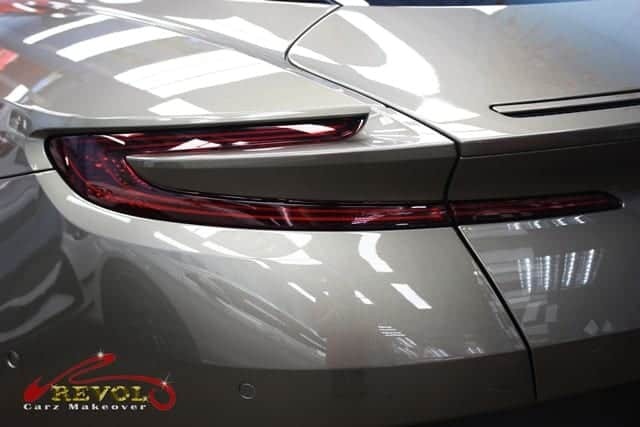 The polished C-shaped LED taillights boast a sleeker design and an extended horizontal element reaching into the centre. Dedicated hand polished dual integrated end pipes give out an aura of sportiness. The large 21” Matt Black Diamond Cut 5-triple spoke rims – all polished and awesome. 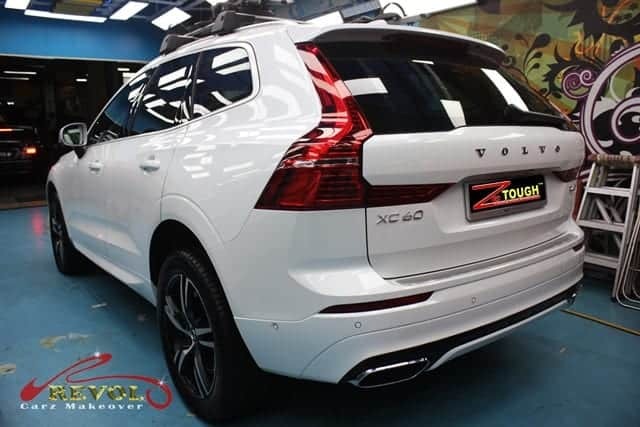 If the brand new Volvo XC60 has impressed you, wait till you see what ZeTough Ceramic Paint Protection Coating can do for your car too. The British Jaguar XE is the most advanced, refined and efficient sports saloon that Jaguar has ever built. With a seductive silhouette of beauty and stunning performance, the XE is every inch a stunning British Jaguar that has been rigorously optimized for aerodynamic efficiency and stability. 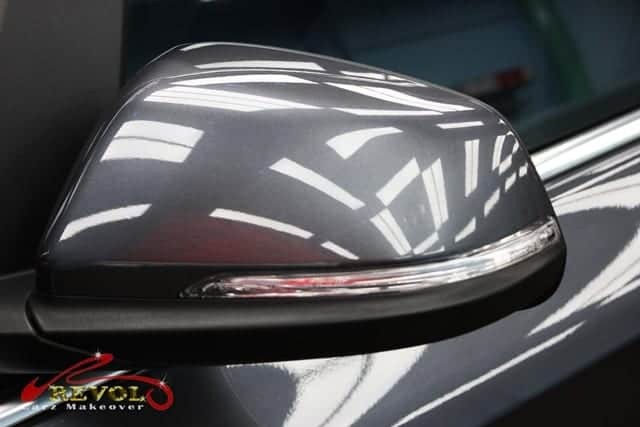 It gave us absolute honor host the arrival of a Jaguar XE 2.0 14P at Revol Carz Makeover for a full car paint re-spray order that comes with our award-winning, ZeTough Ceramic Paint Protection Coating. 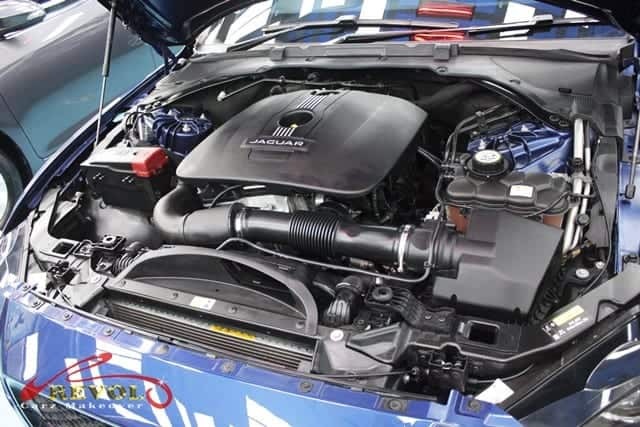 Under the hood lies a turbocharged, all-aluminum construction INGENIUM 2.0-litre, 4-cylinder 300PS petrol engine that delivers effortless performance, refinement and efficiency. Mated to an 8-speed automatic transmission, the effortless century sprint in just 7.1 seconds with the top speed of 227 km/h is very impressive. From comprehensive multimedia technology to intelligent driver aids, Jaguar XE is home to a wealth of innovative and seamlessly integrated technologies. 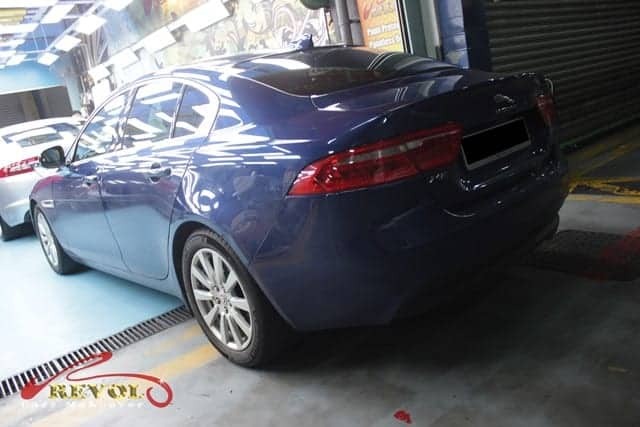 Before the makeover, the Jaguar XE exterior paintwork suffered subtle scratches and dimple-like dents. Some scuffs were also found around the wheel arches. The paintwork on the XE was weathered before the car makeover. Put on your sunglasses! 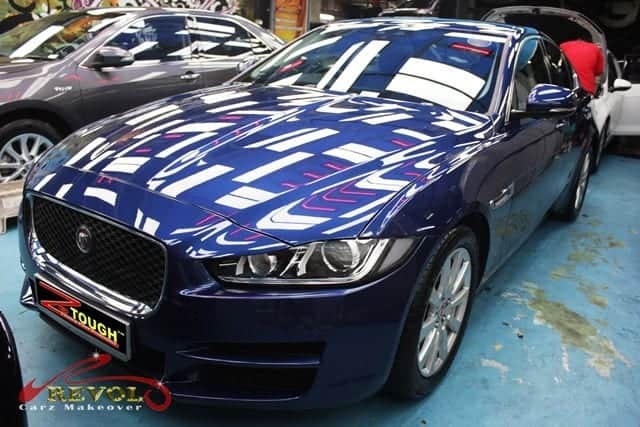 You’ll be stunned by the super glaring shine on the Jaguar XE after the makeover. Thanks to the long-lasting gleam ZeTough Paint Protection Coating. The sculpted gleaming bonnet sweeps back from the distinctive “J” blade head-lights, the Jaguar XE projects its assertive looks after the makeover. The LED headlamps were painstakingly polished by hand to achieve an even more ferocious looks. 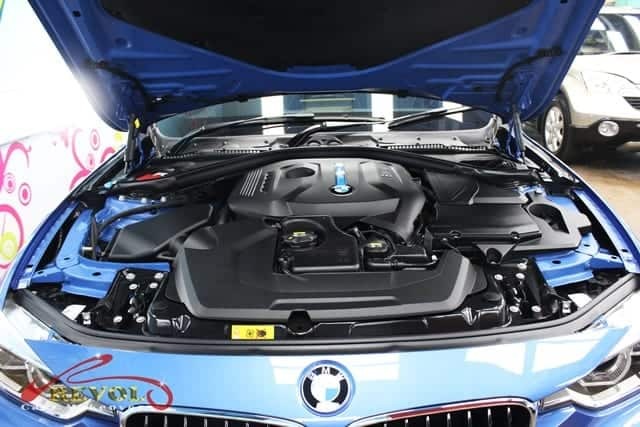 The pride and passion of our detailers is achieving a prized super-clean engine bay that houses the turbocharged, all-aluminum construction INGENIUM 2.0-litre, 4-cylinder 300PS petrol engine. Get connected with the XE the moment you slide into the super-clean form-hugging seats after intensive detailing. You’ll love to climb into the driver’s seat after the interior has undergone extensive detailing to bring back the original forms. The raised rotary centre control adds to the soothing cockpit feel. Every control is at your finger tip. The cleaned contemporary Satin Black rotary selector – the transmission offers quicker shift and sportier kick down. 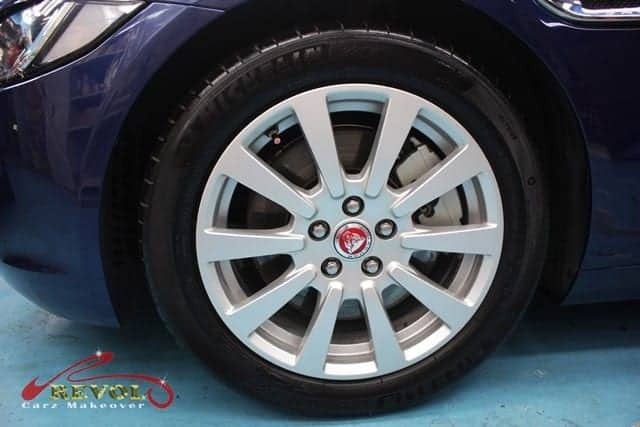 One glance at the stunning lustre and you know the Jaguar has been treated with the renowned and long lasting, ZeTough Ceramic Paint Protection Coating. The iconic tail lights were dismantled and passionately polished by hand for that gem-like finish. Close-up view of the body-colored Power Heated Auto Dimming Side Mirrors w/Power Folding and Turn Signal Indicator before the makeover. 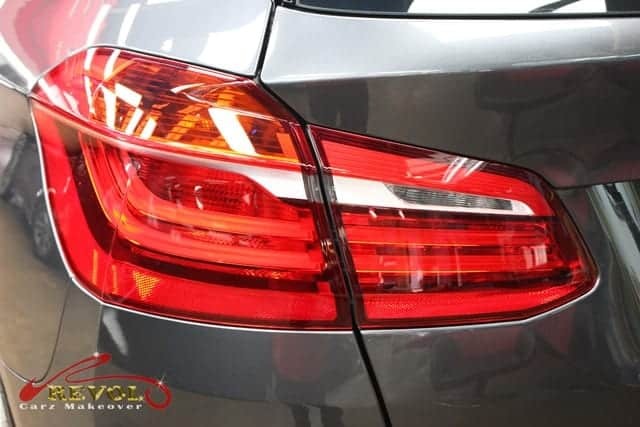 The close-up and in depth look at the breath-taking finish after the ZeTough Ceramic Paint Protection coating is fully cured. 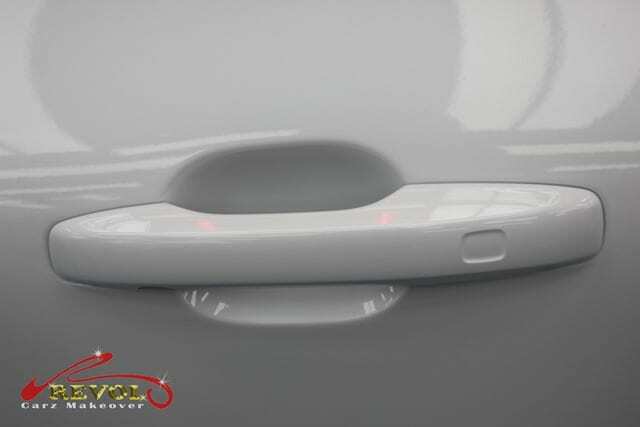 The door handles are commonly subjected to finger-nail scratches without paint protection coating. 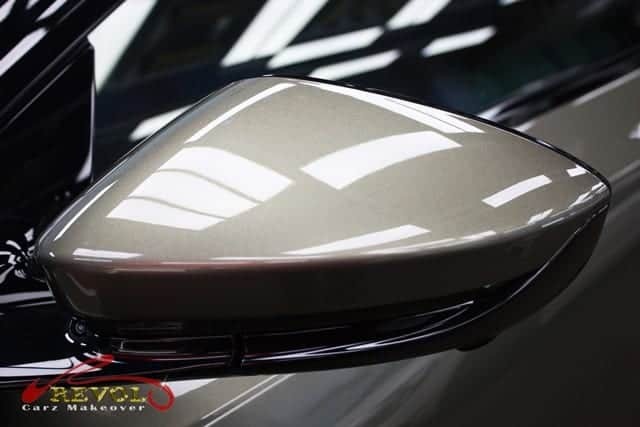 With ZeTough Ceramic Paint Protection Coating, a 9H thickness glass-like film permanently protects the surface around the door handles from fingernails scratches. During the Revol Makeover, all wheels are removed for thorough cleaning, polishing and restoration. All the wheels have been cleaned, polished and fully restored, complimenting the alluring finishing of Revol’s professional makeover. Nothing gives us more inspiration than seeing the satisfied Jaguar XE’s owner beaming a mega-watt smile when he collected his car after the makeover. Thanks to the magic of ZeTough Ceramic Paint Protection Coating. After Revol’s professional makeover, the Jaguar XE 2.0 looks better than showroom condition – permanently. ZeTough’s incredibly long lasting protective lustre gives the XE a lifetime protection. Impressed by the stunning outcome of the makeover on the XE? Your car too can enjoy the reliable, long lasting surface protection. You can count on our award-winning and proven, ZeTough Ceramic Paint Protection Coating. Yes, imagine what we can do for your car! 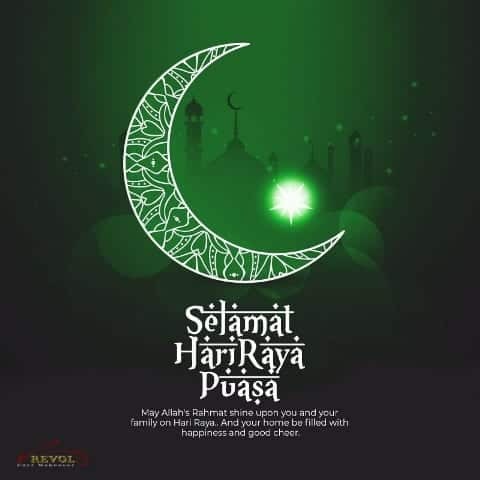 Wishing Everyone A Selamat Hari Raya! 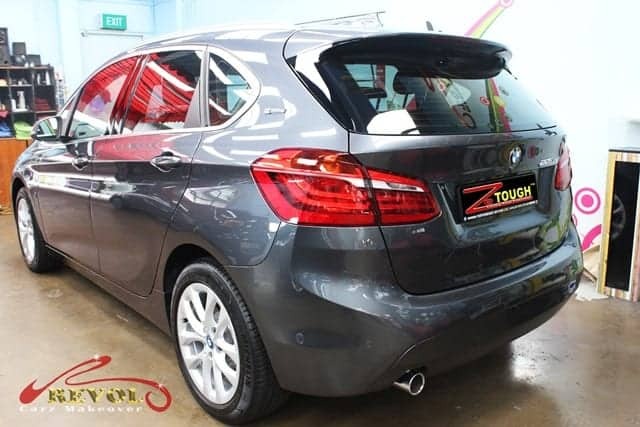 An absolute eye catching new BMW 225Xe Active Tourer created quite a stir when it rolled into Revol Carz Makeover workshop for grooming with the surface treatment with ZeTough Ceramic Paint Protection Coating today. The BMW offers the Plug-in Hybrid (PHEV) variant of the 2-series Active Tourer as part of its iPerformance range. The integration between petrol and electric power is seamless. The 1.5-litre engine and 7.6Wh lithium-ion battery combination produce 221bhp and 385Nm of torque allowing the 225Xe to accelerate from 0-100km/h in 6.7 seconds. 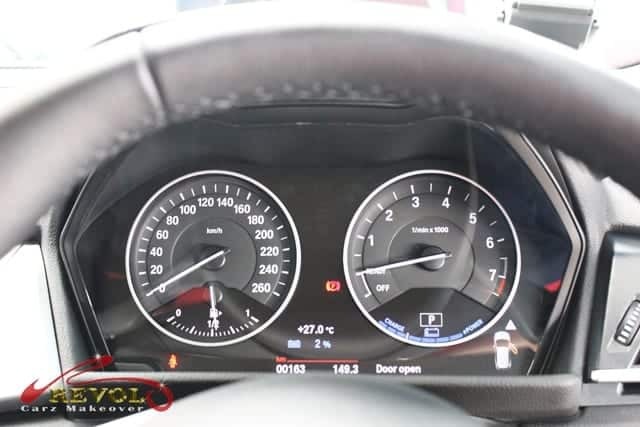 BMW claims its top speed at 270km/h. 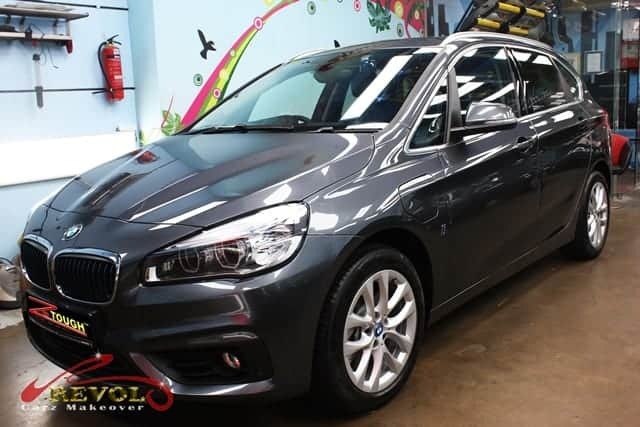 Beyond the drivetrain, the new BMW 225Xe Active Tourer is as unique and exceptional as you would expect. The interior still feels modern with many innovative technologies and upgrades as well. 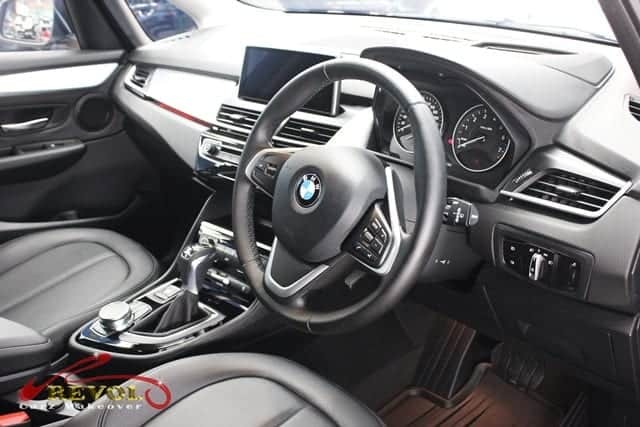 The most noticeable is the updated infotainment system with larger, sleeker screen and BMW’s ConnectedDrive Services. Up front, the kidney grilles have grown larger, while the front bumper now features larger air intake. The rear boasts larger exhausts and a revised bumper complete the exterior tweaks. 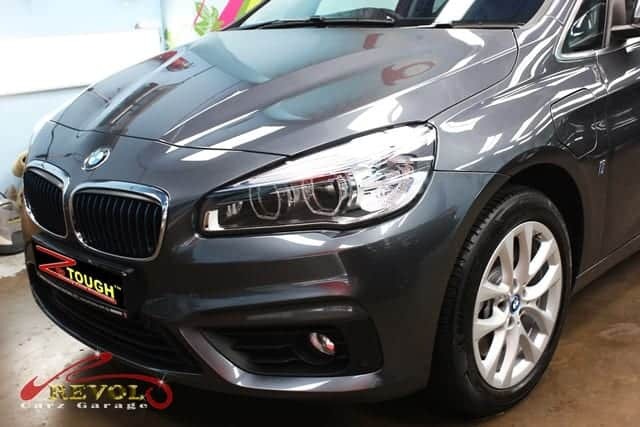 With all the fuss about the new Plug-in Hybrid, the ZeTough Ceramic Paint Protection Coating certainly brought the BMW 225Xe to a higher level with a tough, long-lasting surface protection. The new BMW 225Xe Plug-in Hybrid after grooming with a tough coat of ZeTough Ceramic Paint Protection in showroom condition. The front is breathtaking from the first glance with ZeTough Ceramic Paint Protection Coating. The large three-part air inlets ensure better cooling of brakes and engine. The integrated Air curtains additionally help to reduce the drag resistance of the body. 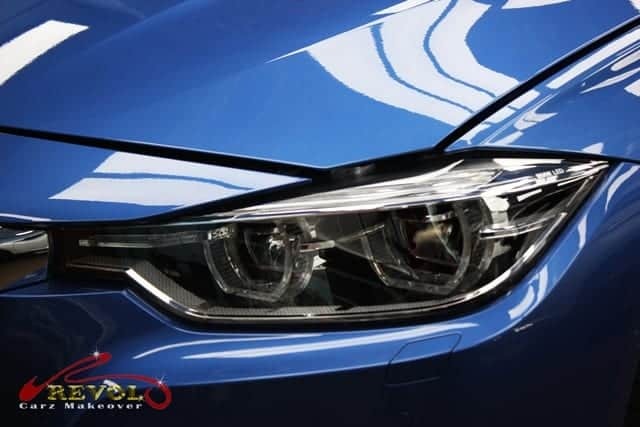 The sharpened BMW LED headlights have been passionately polished by hand. A spotless, super-clean engine is always the joy and pride of our professional detailing skills. The 1.5-litre engine and 7.6kWh lithium-ion battery combine to produce 221bhp and 385Nm of torque, allowing the car to accelerate from 0-100km/h in just 6.7 seconds. The cabin feels even more cozy and inviting after careful detailing. We ensure every nook and corner is absolutely cleaned and sanitized. 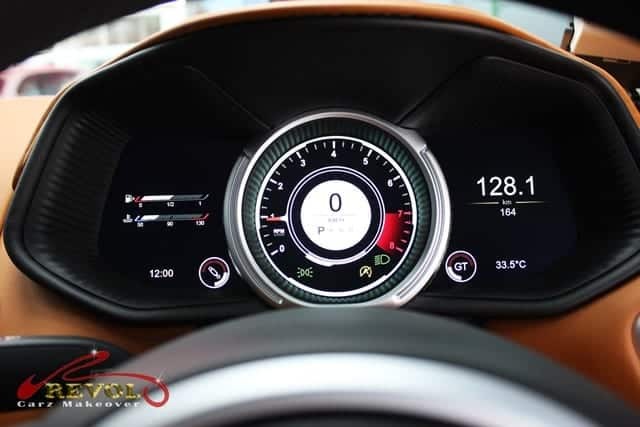 Are you impressed by the well-polished instrument cluster? Every leather surface and seat is carefully sanitized, nourished and treated for long term protection. 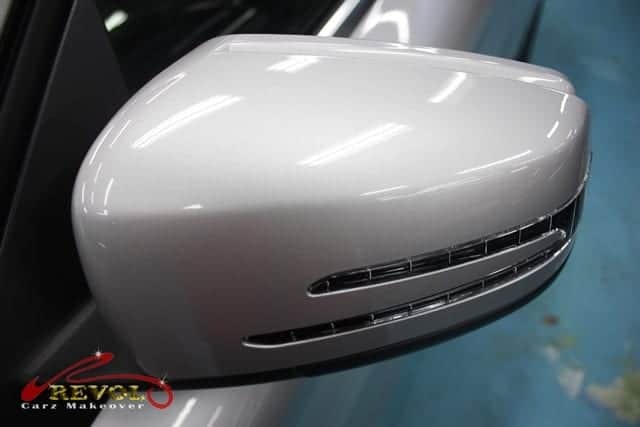 We bring the wing mirror to show the intense, deep gloss after the ZeTough Ceramic Paint Protection Coating is fully cured. The upgraded tail-lights are passionately polished to get the gem-like finish. The rear gets some upgrades too, such as a new “trim finisher on the rear apron,” as well as new exhaust pipes. Look at it from any perspective and you know for sure, the car is protected with a tough coat of ZeTough Ceramic Paint Protection. 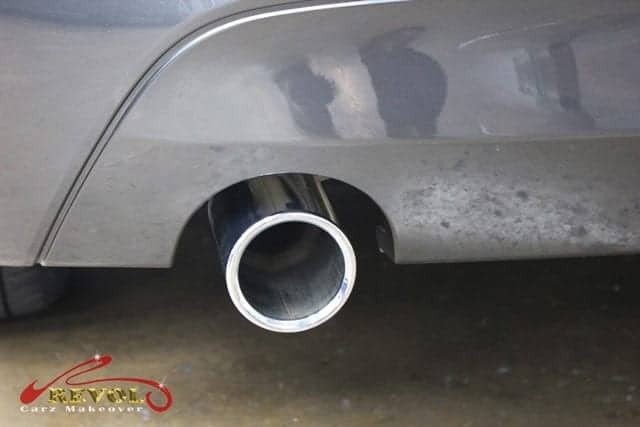 The larger twin-exhaust pipes have been carefully polished by hand to achieve a perfect finish. 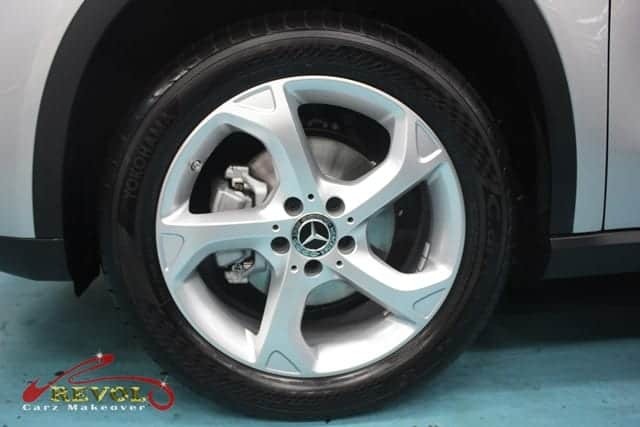 The 17-inch alloy wheels were removed for cleaning, polishing and any scratch or kerb-rash fully restored like brand new again. So, if you’re planning for the future and looking for a future-proof, reliable surface protection for your car, you can count on our award-winning and proven, ZeTough Ceramic Paint Protection Coating. Yes, imagine what we can do for your car too!